The burial Flag Case is from the company that was honored to be selected to provide the flag case for President Ronald Reagan’s burial flag. They have also been chosen by the United States to supply Burial flag cases for the families of our fallen heroes serving in the armed forces. The burial Flag Case solid walnut, hand crafted. The Military Burial flag case is sure to become a treasured keepsake for generations to come. 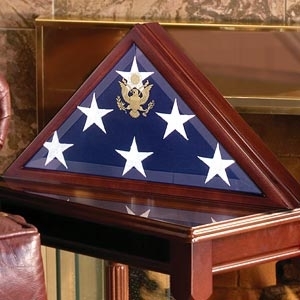 The hand rubbed walnut finish, beveled glass front, and great seal of the United States completes the look of this Burial flag case which creates a proper memorial for your loved one’s tribute of their military service. The Burial Flag case can be proudly displayed in any home and comes complete with wall mountable hardware. I was happy you delivered the exact item I saw on the image of your site. The burial flag case is sturdy and a beautiful walnut finish. It had ample space for me to personalize a sentimental engraving for my husband. I feel honored that the same company that provided a case for Ronald Reagan is the same one that has furnished us a piece so honorable for my husband’s remains. I browsed local stores as well as online for a burial flag case and am very satisfied with my purchase. I love the construction and finish. Thank you once again for such an esteemed burial box for a cherished friend. I love how the Burial flag case is constructed. It arrived in an excellent condition and I couldn’t be happier that my grandmother is being represented in such an honorable way. She was the wife of a veteran, who fought just as hard to keep her family together when he was at war. We love her and miss her, and are glad that she will be commemorated in a distinctive, proud way. Thank you for an easy transaction. I never thought I would have to make this purchase but fortunately you’ve made it easy for me in a very difficult time. The military burial flag case portrayed our late uncle in a dignified way during his memorial service. I love the triangle shaped flag above the display case and the great seal completes the look. Your memorialrial flag case represented our family well. I had no hassle in making the order and I received a very prompt delivery, well before my friend’s scheduled memorial service. Thanks for a beautiful box. This burial flag case is just the thing I was looking for to honor my late father. I had a classic cremation urn before, but felt that this solid wooden case was a bit more suitable with its flag overlay. He served for 20 years in the force and this was very appropriate. I wish I knew about these before. Nothing but the best for Dad.